Got Work? - Welcome to 2B! This is the place you come to in order to complete assignments that your teacher has made for you. Most of the assignments are follow up work to lessons that we have completed in class so you should have no trouble with knowing what is expected for you to do. Sometimes you will do these assignments in your center and other times you will need to do them at home. Remember to read the directions given with each assignment first. It always helps to read directions! Click the icon to the left to go to the Letter Generator for your assignment of the day. You will need to remember the parts of a letter to do your work: the heading, the greeting, the body, the closing, and the signature. 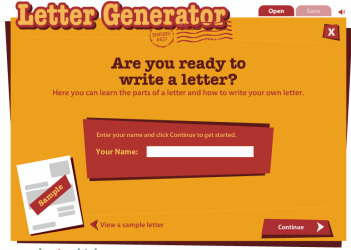 The Letter Generator will help you to place the parts in the correct place. Be sure to make the body of your letter interesting by adding details that your reader shares an interest in. Questions are okay but a letter is much more than a list of questions! When you are finished make sure to print out your letter, get it from the printer, and pass it in to your teacher's "IN-BIN". Click the fall picture to the left to go to the poem about loving fall. Read the poem carefully. Then fill in the blanks with the correct rhyming word that would make sense in the poem. Be sure to use your computer cut (command x) and paste (command v)skills to place the rhyming words where they belong in the poem. Be sure to name and print your work when you are finished. Be sure to place it in your teacher's "IN BIN". Thank You! Click on the Mr. Anker Tests photo to the left to go to an addition practice set. Be sure to type in your name when you are prompted. Work the problems as well as you can. When you get your test score at the end, be sure to Screen Shot (shift/command/4). Go to the desktop to find your screenshot. Be sure to rename it with your name/addition and drag it into your flash-drive. Eject your drive and place it in your teacher's IN BIN. Try not to leave the desktop of your computer messy...throw your screen shot in the trash! It gets too confusing with all those screen shots on the Desktop! Thank You! In class, we practiced adding with a hundreds chart. We used a chart like the one in the "Guide" to the left if you need to review. Then, we went on to add even larger numbers using a hundreds-hundreds chart like the one on the worksheet provided. 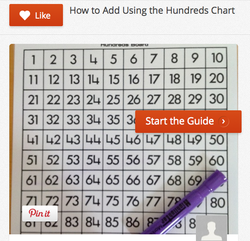 Rewatch the guide for the concept with numbers up to 100 then add even larger numbers using the charts provided with each example on the worksheet! When you are done, be sure to type your name on the page, print it out, and then pass into your teacher's IN BIN!